I'm such a huge fan of custard desserts: pot de crème, crème brûlée and of course, crème caramel (familiarly known as flan). I'll admit that I have yet to make THE perfect flan. One with a silky light custard and a caramel top that's the lovely color of amber. The texture cannot be too runny or too "eggy". In the past, I had always made flan using the more common method of adding condensed milk, but I found it to be a little too sweet and dense. I ran across this recipe which uses heavy cream in lieu of the condensed milk, so I thought I'd give it a try. The original recipe is your standard caramel vanilla flan; I just added the orange for a little extra flavor. To create the caramel: Combine 1 cup of the sugar and 1/4 cup of orange juice in a heavy-bottomed pot or pan. Place over medium-high heat and cook until the sugar begins to melt. Swirl the pan over the heat until the syrup darkens to a medium amber color, about 10 minutes; don't stir with a spoon. 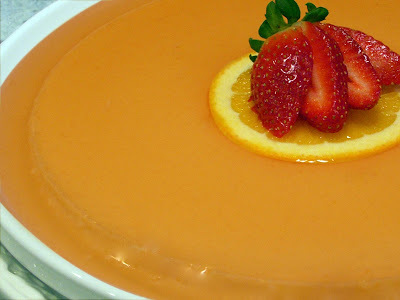 Remove from the heat and immediately pour into a 2-quart round flan mold. Tilt the dish so that the caramel evenly coats the bottom and a bit up the sides, place in the roasting pan and set aside. Preheat the oven to 325 degrees F, bring a kettle of water to a boil for the water bath and keep it hot. Combine 1/2 cup of orange juice, cream, citrus zest, and vanilla in a small saucepan over medium-low flame. Bring the cream to a brief simmer, stirring occasionally. Take care not to let the cream come to a full boil to prevent it from spilling over. In a large bowl, cream together the whole eggs and yolks with the remaining 1/2 cup of sugar. Whisk until the mixture is pale yellow and thick. Temper the egg mixture by gradually whisking in the hot cream mixture; don't add it too quickly or the eggs will cook. Pass the mixture through a strainer into a large measuring cup to ensure that the flan will be perfectly smooth. Pour the custard into the caramel-coated mold. To create the water bath: pour the hot (not boiling) water into the roasting pan to come halfway up the side of the mold; be careful not get water into the custard. Carefully transfer to the middle oven rack, and bake for 30 to 45 minutes, until the custard is barely set and just jiggles slightly. Let the flan cool in the water bath, then refrigerate for at least 4 hours or overnight. When you are ready to serve, run a knife around the inside of the mold to loosen the flan. Place a dessert plate on top of the flan and invert to pop it out. Flan is not a difficult dessert to make, although achieving a good caramel may take some practice. My latest attempt turned out a bit light (boo!). I guess I take a more conservative approach when caramelizing sugar, especially since you can go from a nice amber color to destroying your most prized piece of All-Clad cookware in a matter of a few minutes. In any case, this was pretty tasty and I would definitely make it again. I am not a huge fan of flan, but I did try Dawn's version and was pleasantly surprised. I think the big turn off for me with flan is the texture. However, this version was very light and airy and the texture was especially smoooth. The best part of this flan was the subtle orange flavor. I think the touch of orange and the fact that the flan was not overly sweet made the overall experience very pleasing to the palette.